So this project…let’s say it really appealed to me. REAL nerds know it stands for Library Computer Access/Retrieval System. 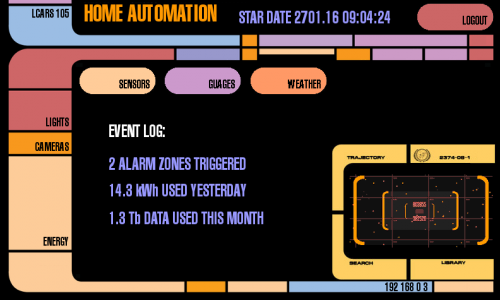 This is the first finished, publicly available LCARS interface we’ve seen for the Pi (and it works with a touchscreen as well); Toby Kurien has made this adaptable for any project you’re running on your Raspberry Pi, so you can substitute your own retro-future display for whatever dull desktop you’ve been using up until now. Everything you need is on Toby’s GitHub. Toby’s using one of our official displays here, and the finished product looks (and sounds) great. While Toby’s using this interface to monitor and control different parts of his automated house, he’s made it easy for you to swap in your own project. Go and take a look at the code, and report back if you end up using it! This is not a Rob Z post, but I am going to pretend it is. Bajoran earring ….. PHOTOS Please!!!!!!!!! PLEASE!! !….there MUST be photos of that …. PLEASE!! Gonna have to take this great project for a spin. Rob has to be nice to me; I have a package of Japanese curry products which I won’t give to him if he’s horrid. So there. It doesn’t actually interface to anything though, it is just a series of graphics. Not sure I would call it “finished”. It’s a really great implementation of LCARS – really well done. I doubt it’ll be up for long. Never belonged to a Star Trek club, but my brothers and I formed many away parties exploring the class m planet known as Grandma and Grandpa’s farm back in the 70’s. Get Eben to hurry up on that pi 3A, and maybe I’ll try making a TOS tri-corder. Ummm….does it count that my wife was the one that started the original Star Trek Concodence? The one that had the 3rd season added to it and then published by Bjo Trimble? Ummm….does it count that my wife was the one that started the original Star Trek Concordence? The one that had the 3rd season added to it and then published by Bjo Trimble? I love the little Trek gifs! It should become standard on all web blogs! Now, to couple this with Android Auto for my 1992 Mustang coupe. Does it run on the Pi Zero? Is it me, or does it look a lot like some of the microwave oven control touch panels of the ’70s? Anyone who has an idea to make it work? Recantha’s only gone and made a tricorder. I've been waiting for...ooh, just over a year, for someone to do this.